From the Department of Emergency Medicine, University of Ottawa, Ottawa, Ont. Intraosseous vascular access is a technique in which the bone marrow cavity is used as a noncollapsible vascular entry point (Figure 1). It is considered to be the standard alternative to peripheral intravenous access and is endorsed in major resuscitation guidelines,1 including Pediatric Advanced Life Support, Advanced Cardiac Life Support and Advanced Trauma Life Support. It should be considered early in the resuscitation of critically ill adult or pediatric patients if rapid and timely peripheral intravenous cannot be established or has failed. An intraosseus needle within the bone marrow cavity. Using the proximal tibial site (most common site; Appendix 1, available at www.cmaj.ca/lookup/suppl/doi:10.1503/cmaj.120971/-/DC1), an observational study achieved flow rates of 165 mL/min (1 L in just over 6 min).2 These rates are more easily accomplished with a 10 mL flush of saline before infusion and the use of a pressure bag. In an observational study involving healthy adult volunteers, mean insertion and removal pain scores measured on a 10-point visual analogue scale were 3.9 (standard deviation [SD] 1.5) and 2.2 (SD 2.9), respectively.3 Treatment with 1 mL of 2% lidocaine before infusion produced a mean infusion pain score of 2.0 (SD 1.2) with 300 mm Hg of infusion pressure.
. Intraosseous access. 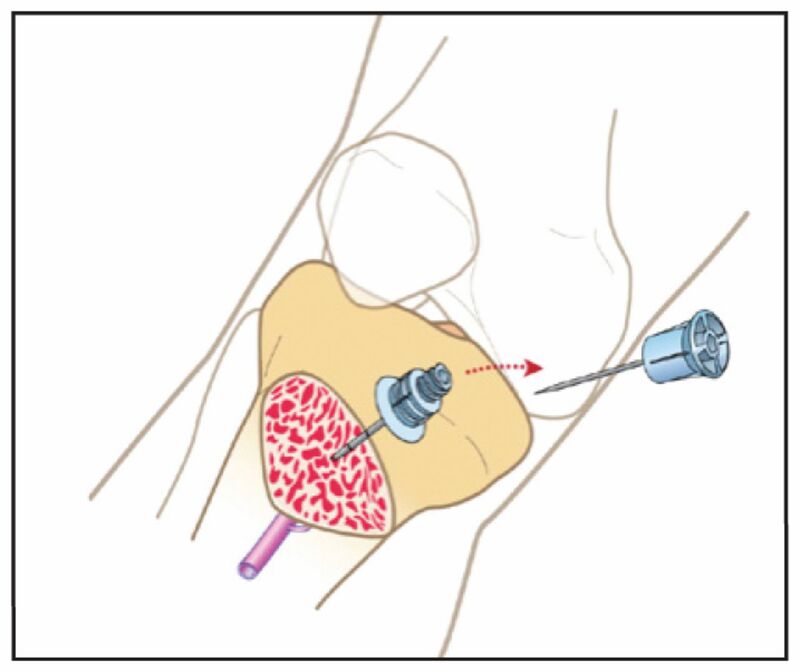 J Emerg Med 2010;39:468–75.
. EZ-IO in the ED: an observational, prospective study comparing flow rates with proximal and distal tibia intraosseous access in adults. Am J Emerg Med 2012 Jan 11.
. Pain management during intraosseous infusion through the proximal humerus. Ann Emerg Med 2009;54:S128.
. Intraosseous versus intravenous vascular access during out-of-hospital cardiac arrest: a randomized controlled trial. Ann Emerg Med 2011;58:509–16.
. Intraosseous vascular access in adults using the EZ-IO in an emergency department. Int J Emerg Med 2009;2:155–60.